Marilyn Cornwell Blog: Not Just Any Car! Father's Day originates in West Virginia in July 1908. While it is known it was first celebrated then, there aren't many records of the event. The next celebration was in 1910 in Spokane, Washington on June 19th. It was a city celebration of 'sermons honouring fathers presented throughout the city'. It faded away until the 1930's when it was promoted again and became a consistent celebration. There's a special place for cars in the celebration of Father's Day. Yesterday was a happy day for Porsche owners in our area. We participated in the Niagara Fun-Run and drove our way around the Niagara area - from Grimsby to St. Catharines, up and down over the escarpment, among the vineyards and fruit orchards - all on those great country roads. 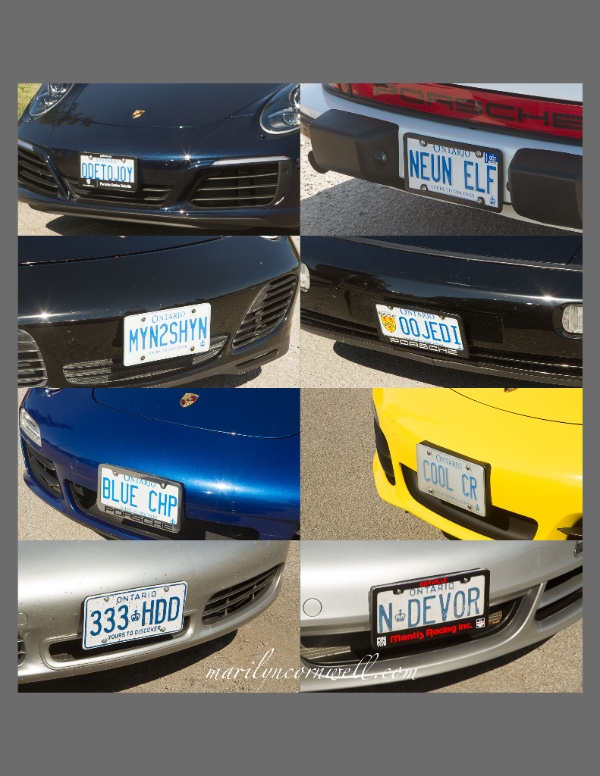 Here are a few of the license plate names of the almost 60 cars that participated. There was more than one group touring the escarpment - we met this group of motorcyclists up on the escarpment. That's a formidable sight coming towards you!